How Am I Just Finding Out About This? Wow. So this show looks funny. Apparently, FOX banned this clip. Amazing. And hilarious. BTW - HEADPHONES! By the time I was 5 seconds into this video, I'd completely forgotten about everything that Michael Vick had been accused of. Also - I wonder how many times the thought, "You've got to be shitting me" went through that horse's head. And of course this lady's name is Brenda. "It's the closest thing to Shangri La." Marking my 2010 calendar now. This looks 100% epic with a 90% chance of being totally awesome. + Action Parks popularity went hand in hand with a reputation for poorly-designed, unsafe rides; inattentive, underaged, underpaid and sometimes under-the-influence employees; equally intoxicated and underprepared visitors — and the poor safety record that followed from this perfect storm of circumstances. + The director of the emergency room at a nearby hospital said they treated from five to ten victims of park accidents on some of the busiest days, and the park eventually bought the township of Vernon extra ambulances to keep up with the volume. + Action Park let customers race miniature open-cockpit race cars on long track. Extra money was charged to drive them, and the carts could be adjusted for speed by knowledgeable park employees, with similarly harmful consequences to riders. A former employee stated that after the park management briefly set up a microbrewery nearby, employees looking for after-hours fun would break into it, steal the beer, and then ride the cars on Route 94. 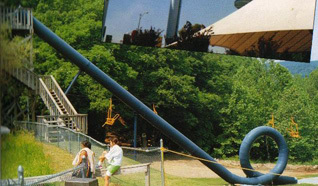 + In the mid-1980s, Action Park built an enclosed water slide, not unusual for that time, and indeed the park already had several. But for this one they decided to build, at the end, a complete vertical loop of the kind more commonly associated with roller coasters. Employees have reported they were offered hundred-dollar bills to test it. + One worker told a local newspaper that "there were too many bloody noses and back injuries" from riders, and it was widely rumored, and reported in Weird NJ, that some of the test dummies sent down before it was opened had been dismembered. Toledo Mayoral Candidate Ben Konop Heckled at Press Conference. Hang in there until 1:24 to see the dude. Actually - I'm kinda surprised she didn't whip her crank out. I have could watched this for hours. This is about the only time in your life where the knowledge you gained about how fulcrums work in 4th grade comes in handy.